A number of foods, including poultry, ground beef and even curry powder have been recalled recently due to confirmed or possible contamination. Here's a roundup of the foods health officials are warning consumers about this Thanksgiving. WASHINGTON — Lions, tigers and bears (oh my) is looking like E. coli, salmonella and listeria (oh no) this Thanksgiving. A number of foods — including poultry, ground beef and even curry powder — have been recalled recently due to confirmed or possible contamination. Here’s a roundup of the foods health officials are warning consumers about. 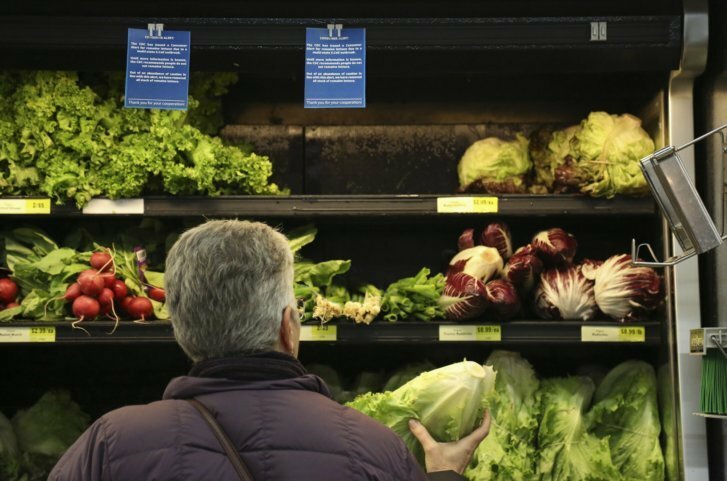 Romaine lettuce: Please romaine calm but the Food and Drug Administration is warning Americans not to eat any romaine lettuce due to a new multistate E. coli outbreak that’s impacting those both in the U.S. and Canada. The nasty bug has sickened 32 people in 11 states and 18 people in the Canadian provinces of Ontario and Quebec. Turkey: Health officials are reminding people to properly handle and cook their Thanksgiving birds amid a widespread salmonella outbreak linked to raw turkey that has resulted in one death and 164 reported illnesses in 35 states. Hormel has recalled some packages of Jennie-O ground turkey that regulators were able to tie to an illness. Salmonella in food is estimated to be responsible for 1 million illnesses a year, with symptoms including vomiting, diarrhea and stomach cramps. Chicken: A total of 92 people in 29 states have been infected with an outbreak strain of salmonella infantis linked to chicken products, the CDC reported last week. While no deaths have occurred, 21 people have been hospitalized. Because salmonella infections can spread from one person to another, the CDC recommends washing hands before and after preparing or eating food, after contact with animals, and after using the restroom or changing diapers. To kill harmful germs, raw chicken should be cooked thoroughly to an internal temperature of 165 degrees Fahrenheit while leftovers should be reheated to the same temperature, according to the CDC. Raw beef: Sixty-three additional cases of salmonella have been identified in an ongoing, multistate outbreak linked to raw beef products, the CDC reported Tuesday. Those who are sick began experiencing symptoms between Aug. 5 and Sept. 28. Ready-to-eat meats and poultry: Bakkavor Foods USA, Inc. is recalling almost 800,000 pounds of ready-to-eat meat and poultry products that contain an onion ingredient which may be contaminated with salmonella and listeria monocytogenes, according to the USDA. The items were produced from Sept. 27, 2017, through Oct. 15, 2018, and distributed to Trader Joe’s and Harris Teeter. Duncan Hines cake mixes: A recall was issued for four types of Duncan Hines cake mix due to possible salmonella contamination, the US Food and Drug Administration said Oct. 21. The voluntary recall was issued by Conagra Brands due to “a positive finding of Salmonella in a retail sample of Duncan Hines Classic White cake mix that may be linked to a Salmonella outbreak that is currently being investigated by CDC (U.S. Centers for Disease Control and Prevention) and FDA,” Conagra said in a statement. Curry powder: UBC Food Distributors Inc. voluntarily recalled 7-ounce plastic containers of Baraka brand hot curry powder (UPC Code 822514265566) and curry powder (UPC Code 822514265535), according to the US Food and Drug Administration. This recall is due to a high level of lead found in these products by the Michigan Department of Agriculture & Rural Development. No safe level of lead ingestion has been identified for children, according to the U.S. Centers for Disease Control and Prevention, which lists 5 micrograms of lead per deciliter of blood as the danger point for a child. The Associated Press and CNN Wire contributed to this story.